Last week sweetheart and I were busy cleaning the kitchen/dining room. After we finished cleaning, I needed a little rest. I baked this fig galette with some fresh figs a neighbor had given me, and I wanted to enjoy a piece of tart on the patio with a cup of tea. As Summer is drawing to an end I knew I wouldn't be able to have many more chances to sit, relax and enjoy my tranquile garden. I was looking for something pink for Pink Saturday when I found this vintage tea pot at the thrift store. Pink and White, genuine Ironstone. The pink roses are so delicate and add a softness to the tray. The little books I found at the Dollar Tree. Each lady received a book as a gift at my 2011 Christmas Tea. I have a couple of tea parties to plan for November and December. I was delighted to have some time to contemplate about the menus and all the wonderful things that go with planning a tea. I bought the three piece set at an estate sale when I first retired about five years ago. I love the pink candy stripe with the gold accent on the tea pot. 'First Love' dessert fork and demi spoon are from my vintage set of silverware. The little bottles are precious to hold a blossom or two. I sat sitting on the swing thinking about the wonderful summer and the joyous time spend with family and friends. A calm and restful retreat and a cup of tea. I will be joining some great bloggers at their parties. Please link up and check out the fun. Thanks again to my new followers. Oh my, the teapot is adorable, soo pretty! What a sweet find and your table setting for tea is lovely. I'd love to have some tea with you and help you plan your outcoming tea parties..I love tea parties, to go and to make them,lol.. Enjoy the weekend. Your teapot is a great find - and your galette - oh yummy! I so love your pink teapot! Awesome! It looks like you have a lovely spot to enjoy afternoon tea. Enjoy your last days of summer. Winter finished here a couple of days ago, but is having a good rain and blow here today. We need it as it has been a dry winter. I love your teapot, and have printed the recipe for your Galette. It sounds delicious! have a wonderful week. your teapot is a wonderful find. looks lovely with your Haviland - Limoges pieces. beautiful tea on the patio at the end of summer. thanks for inviting us. Beautiful and delicate. I love it! The tea pot is gorgeous and I love those sweet books. I think I have one of them! Happy Monday! Pretty pink tea pot and the fig galette looks delicious. It sad to to know that this is our last summer meal outside the porch, right? Well, another time nxt summer. I do adorn you tea set. Very romantic. I felt as though I had joined you for your lovely tea on the porch. I love your pretty dishes and teapot. I too am sighing and reminiscing about summer's good times. I just had several family birthday celebratons, a class reunion, participated in a big fifties event; so a very full summer. But now I look forward to the beauty and bounty of fall, but maybe just a few more summer moments? what a cute tea time. Love the pink accents and the tea pot is really pretty. Thank you for sharing this recipe, too. Your teapot is darling and your teacup and plate look so very lovely with it! 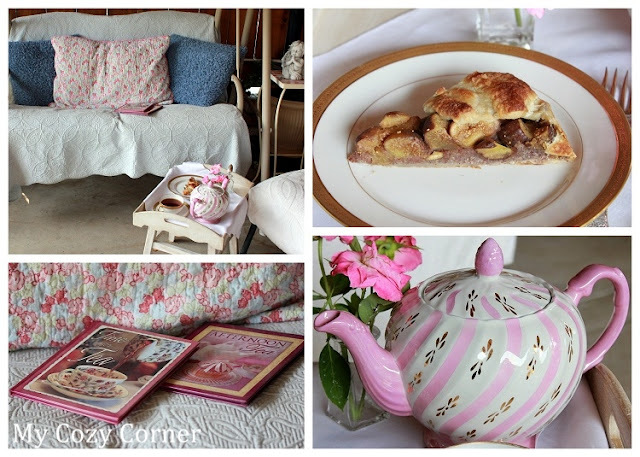 I would love a taste of the fig galette with a cup of tea; yum! Thank you for joining me and enjoy your week. This makes me want to get back into enjoying an afternoon tea. When I was growing up my Mother always held tea. It was delicious but unfortunately time does not allow for that now. What a lovely patio you have! Having tea there looks so relaxing. What a wonderful find with your darling teapot! Beautiful teacup too! How sweet and cozy...I love your darling teapot! Thank you for linking up and sharing this with us. What a refreshing and relaxing post! Your outdoor tea looks divine! I adore your new thrifted vintage tea pot! And your tea cup! But your fig dessert makes my mouth water! Stunning delectable respite time ... love that fabulous teapot. Betty, your tea time looks very inviting. Love figs! This reminds me of the fig bars my mom used to make. Your little pretty pink tea pot, aided just the right touch your patio setting. I am in love with the pink tea pot! What a beautiful find! !